More than 70% of Indians surveyed during May-July 2018--the beginning of the last year of Prime Minister Narendra Modi’s government--said the lack of employment opportunities and rising prices are India’s most pressing challenges, as per a new Pew Research Centre survey released today. 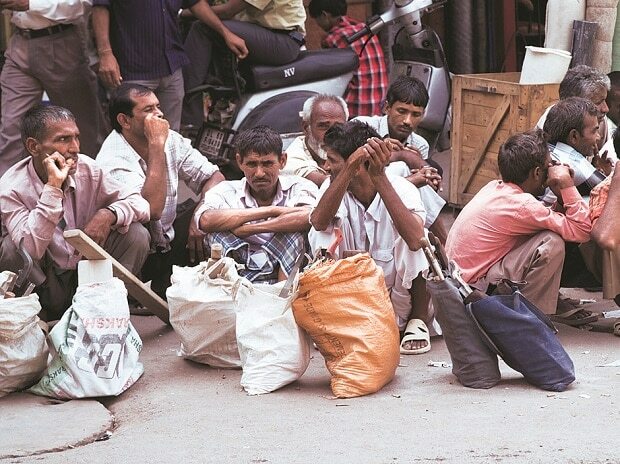 The unemployment rate is currently estimated to be at a 45-year high, reaching 7.8% in urban areas and 5.3% in rural ones, according to a leaked National Sample Survey Office report for 2017-18. This may go some way to explain why the proportion of people “happy with the way things are going” in the country has also fallen by 15 percentage points since the previous year (from 70% in 2017 to 55% in 2018). Corrupt officials, terrorism and crime are the next major problems identified, with over 60% of people saying they are a ‘very big problem’. The findings mark no change from last year when employment opportunities also topped the list as the biggest problem facing the country. Jobs: No more than 21% of respondents said the employment situation had improved over the past five years, while 67% said it had deteriorated. With India’s shrinking employment opportunities viewed as a key concern for three quarters of the population, 64% of respondents said emigration in search of jobs was also another major problem affecting the country. Corruption: Attitudes towards stemming corruption were similar, with 65% saying the situation had become worse and 21% saying it had improved. The rising prices of goods and services were another major concern, as 65% said inflation had exacerbated since five years ago. Just over half (54%) said the gap between the rich and the poor in India had widened over the past five years, and 27% said it had narrowed. The wealth held by the richest 1% of Indians reportedly saw a 15-percentage-point rise in just over a year, from 58% in 2018 to 73% 2019, according to a 2019 Oxfam report on inequality, as IndiaSpend reported on January 24, 2019. Air pollution: Nearly 51% of respondents said air quality had declined since 2014, while 27% said air pollution had improved. Communalism: Just under half (45%) of the respondents said they believed communal relations had worsened since 2014, while 28% said the situation had improved. The number of communal riots increased by 24% from 703 in 2015 to 869 in 2016, according to data from the National Crime Records Bureau (NCRB). With the annual Crime in India reports for 2017 and 2018 yet to be released, trends for the last two years are unclear. For instance, supporters of the opposition Indian National Congress (Congress) party are 21 percentage points more likely to believe job opportunities have worsened over the past five years, than those backing the ruling Bharatiya Janata Party (BJP). “Indians voice strong frustrations about elections and elected officials”, the report said, with up to 64% of respondents saying they believed most politicians are corrupt and 58% saying they believed nothing changes much after elections. No more than 33% said they believed elected officials actually care what ordinary people think. A further 54% said they believed most people live in areas where it is too dangerous to walk around at night, indicating concerns around safety and the rule of law among more than half the population. These attitudes may explain why no more than 54% said they were ‘very satisfied’ with democracy, down from 79% a year ago--a decline of 25 percentage points. Nevertheless, 58% said free speech is protected and 59% said they believe most people have “a good chance” to improve their standard of living. Just under half, however, said they believed the court system treats everyone fairly (47%), with a sizeable proportion (37%), saying they did not believe that is not the case. More than 75% of respondents viewed Pakistan as a serious threat, and only 7% said Pakistan is no danger to national security. Even ahead of the Pulwama attack, 53% of respondents said the situation in Kashmir had deteriorated over the last five years, with just 18% believing it had improved. Further, 58% of respondents said the government should step up its military action against Pakistan. Partisan attitudes are evident on this issue, too, with those expressing “confidence in Narendra Modi” 70% more likely to see Pakistan as a threat than those with less confidence in the Prime Minister, the report said. Among those with less favourable attitudes to Modi, a slim majority (51%) viewed Pakistan as a threat. International perceptions of India throughout Prime Minister Modi’s term in office have remained largely stable, the report added. Several countries including Australia, South Korea and Japan recorded improved attitudes towards India between 2014 and 2018, the highest being a 13-percentage-point rise in the Philippines. The US and Japan both posted a “negligible” five-percentage-point decline. There is some mismatch in how Indians view their country’s position on the world stage, and how India is received by a wider audience. While 56% of Indian respondents said their country is now playing a greater role in global affairs, an average of no more than 28% of people among 26 surveyed countries agreed. However, sizeable groups in several wealthy countries said India’s role was growing, namely France (49%), Japan (48%), South Korea (48%), Sweden (47%) and the UK (46%). Most people across the countries surveyed (34%) said India’s role had stayed the same for the past decade. In this category are Brazil and South Africa, two fellow BRICS nations, where larger groups (32% and 37%, respectively) saw India as having a less important role in the world today compared to 10 years ago. (Sanghera is a writer and researcher with IndiaSpend.) Republished with permission from IndiaSpend. Read original article here.